President Dwight D. Eisenhower's family wants to halt the planning of a memorial honoring the 34th president because they object to the design. The family says architect Frank Gehry's concept overemphasizes "Ike's" humble Kansas roots and neglects to show his many accomplishments during World War II and his time at the White House. Gehry has proposed large metal tapestries with images of Eisenhower's boyhood home in Abilene, Kan., and a statue of a young Eisenhower seeming to marvel at what would become of his life. On Tuesday, the family asked the National Capital Planning Commission in a letter to delay the memorial until their concerns are met. The letter was obtained by The Associated Press. Anne Eisenhower, one of the president's granddaughters, sent the formal objection to National Capital Planning Commission on Tuesday on behalf of the family. Last month the family spoke to the Washington Post about the design concerns. "We have some serious concerns about the design," Eisenhower's 59-year-old granddaughter Susan told the Post. "I don't think my grandfather would be comfortable with the scale and scope of this design." 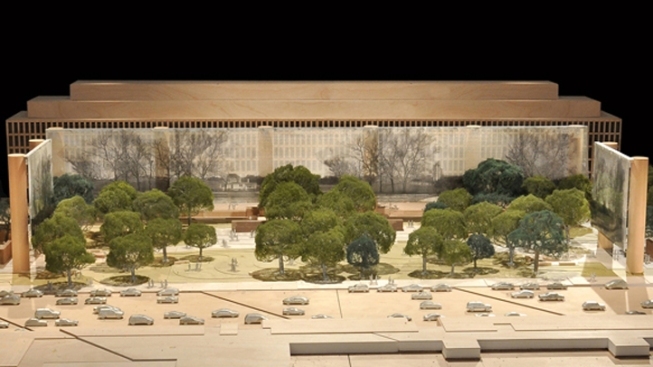 The memorial would be located on a four-acre parcel of land on Independence Avenue between Fourth and Sixth Streets, Southwest, across from the National Air and Space Museum. Gehry's design, which can be viewed at the Eisenhower Memorial Commission's website, is framed by 80-foot woven steel tapestries that would show winter images of Eisenhower's native Kansas and be attached to steel columns measuring 11 feet in diameter. The park itself would feature a statue of Eisenhower as a young boy looking toward bas-reliefs modeled after famous photographs of the former supreme commander of the allied forces in Europe during World War II. Gehry has stated that the idea for the statue of the boy Eisenhower comes from a 1945 homecoming speech that the general gave in his hometown of Abilene, Kansas, in which he referred to "the dreams of a barefoot boy." The National Capital Planning Commission is currently scheduled to hold a hearing for preliminary approval of Gehry's design in February.